Progenitor cells and stem cells are two types of cells that are capable of differentiating into specialized cell types in the body of multicellular organisms. 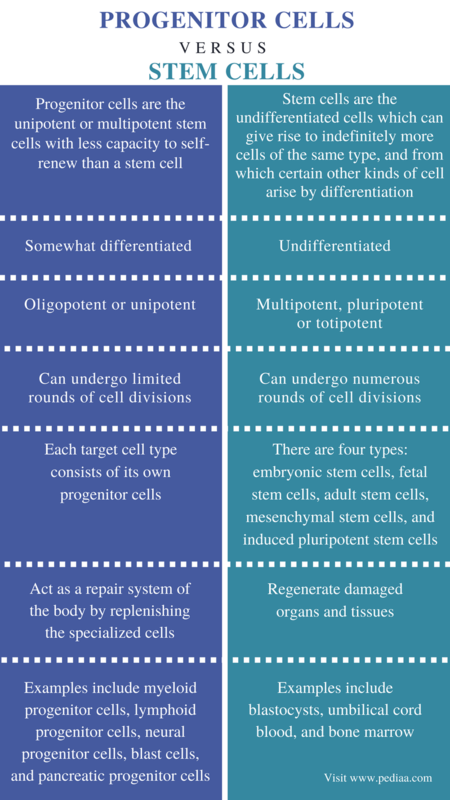 The main difference between progenitor cells and stem cells is that progenitor cells are early descendants of stem cells that can differentiate to form one or more types of cells whereas stem cells are the undifferentiated cells that are capable of differentiating into many types of specialized cells in the body. These progenitor cells are somewhat differentiated from the stem cells. Progenitor cells cannot divide and reproduce indefinitely. In contrast, stem cells are capable of self-renewing through numerous cell division cycles. Moreover, they are undifferentiated cells that are capable of differentiating into all cell types (totipotent) in the body of multicellular organisms or several cell types (pluripotent). Stem cells are first differentiated into progenitor cells; then they are differentiated into a specific cell type in the body. Progenitor cells are early descendants of stem cells that can differentiate to form one or more types of cells. They show less capacity to self-renew than stem cells. Furthermore, they can undergo fewer rounds of cell divisions to produce more cells of their type. That means progenitor cells lie between stem cells and mature, functional cells in the body. Progenitor cells play a critical role in the replacement and repair of damaged tissues in the body. Generally, these cells are in the inactive form. They can be activated by the growth factors, cytokines or artificial differentiation reagents. Upon activation, a particular progenitor cell not only differentiates into their specialized cells types but also migrates to the target locations of the tissue. The progenitor cells are typically unipotent. That means a particular progenitor cell type can give rise only to a particular specialized cell type. These type of cells are called precursor cells. Therefore, each type of target cell consists of its own progenitor cells. However, some progenitor cells can be oligopotent and are capable of differentiating into a few different cell types. For example, the myeloid progenitor cells are capable of differentiating into red blood cells as well as neutrophils. 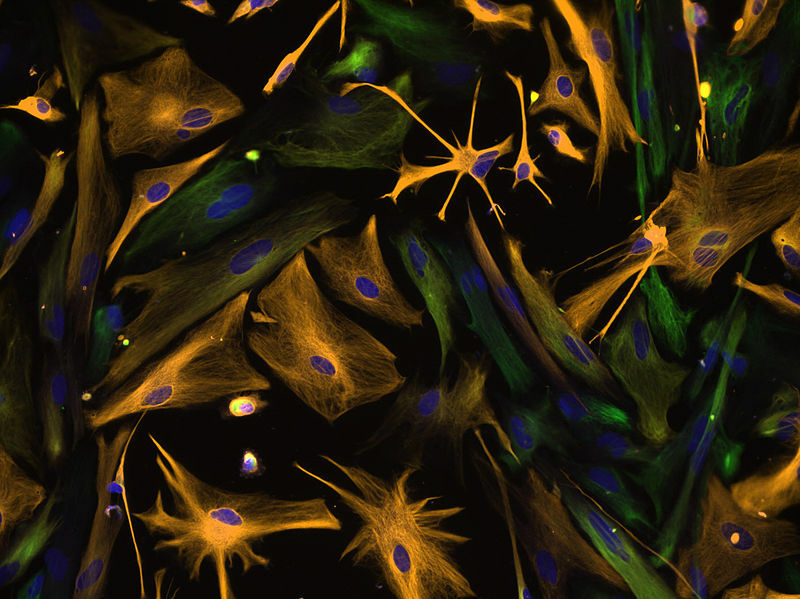 The progenitor cells in the brain are shown in figure 1. Stem cells are the undifferentiated cells in the body of multicellular organisms. They are capable of self-renewing to produce many cells from its own type. Stem cells are capable of differentiating into different types of specialized cells as well. Two major types of stem cells can be identified: embryonic stem cells and adult stem cells. The embryonic stem cells occur in the four-five days old human embryo during the blastocyst phase of development. The morula develops into the blastocyst. The blastocyst comprises the inner cell mass called embryoblast and the outer cell mass called trophoblast. All adult organs in the body are developed from the embryoblast. The trophoblast is developed into the placenta. Therefore, morula can be considered as totipotent, and the embryonic stem cells can be considered as pluripotent. The fetus also consists of stem cells with lesser potency than embryonic stem cells. The adult stem cells are the quiescent cells that are found in the bone marrow, brain, blood, liver, skeletal muscles, and the skin. They are induced to proliferate and differentiation in various diseases and tissue injuries. Since adult stem cells can only differentiate into the specialized cells in a particular tissue, they are also called tissue-specific stem cells. The development of the stem cells in the body is shown in figure 2. The mesenchymal stem cells (MSCs) are another type of stem cells that are isolated from the stroma of the connective tissue. Bone marrow is a type of mesenchymal stem cells that can differentiate into bone, cartilage, and fat cells. The induced pluripotent stem (iPS) cells are the tissue-specific stem cells isolated from the body that are induced to behave like embryonic stem cells. The stem cells in the skin can be used as induced stem cells. Both progenitor cells and stem cells are capable of differentiating into specialized cell types in the body of multicellular organisms. Both progenitor cells and stem cells are induced by external factors such as cytokines and growth factors to differentiate into specialized cells. Progenitor Cells: Progenitor cells are the unipotent or multipotent stem cells with less capacity to self-renew than a stem cell. Stem Cells: Stem cells are the undifferentiated cells of a multicellular organism, which can give rise to indefinitely more cells of the same type, and from which certain other kinds of cell arise by differentiation. Progenitor Cells: Progenitor cells are somewhat differentiated cells. Stem Cells: Stem cells are undifferentiated cells. 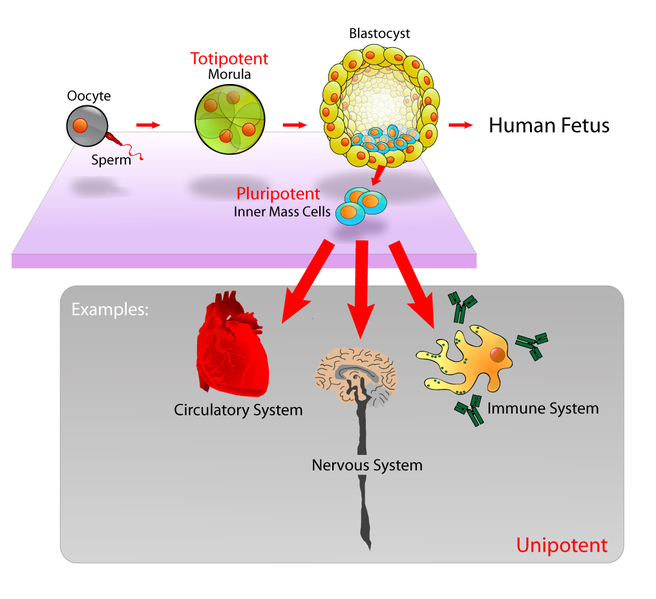 Progenitor Cells: Progenitor cells are oligopotent or unipotent. Stem Cells: Stem cells are multipotent, pluripotent or totipotent. Progenitor Cells: Progenitor cells can undergo limited rounds of cell divisions. Stem Cells: Stem cells can undergo numerous rounds of cell divisions. Progenitor Cells: Each target cell type consists of its own progenitor cells. Stem Cells: The four types of stem cells are embryonic stem cells, fetal stem cells, adult stem cells, mesenchymal stem cells, and induced pluripotent stem cells. Progenitor Cells: Progenitor cells act as a repair system of the body by replenishing the specialized cells. Stem Cells: Stem cells regenerate damaged organs and tissues. Progenitor Cells: Myeloid progenitor cells, lymphoid progenitor cells, neural progenitor cells, blast cells, and pancreatic progenitor cells are the examples of progenitor cells. Stem Cells: Blastocysts, umbilical cord blood, and bone marrow are the examples of stem cells. Progenitor cells and stem cells are two types of cells in the body of multicellular organisms that are capable of differentiating into specialized cell types. Progenitor cells are unipotent and called precursor cells. They can only be differentiated into one or a fewer types of specialized cells in the body. In contrast, stem cells are capable of differentiating into many types of specialized cells in the body. The main difference between progenitor cells and stem cells is the potency of each type of cells. 1. “Progenitor Cells & Media.” Lonza, Available here. Accessed 11 Sept. 2017. 2. “What are Stem Cells?” Medical News Today, MediLexicon International, 19 July 2013, Available here. Accessed 11 Sept. 2017. 3. “Types of Stem Cells.” A Closer Look at Stem Cells, Available here. Accessed 11 Sept. 2017.